Earlier this year, Beverly Harper sold the last of her limited edition print, Left on Trinity. It’s a milestone worth celebrating but with a little sadness knowing this popular image of Trinidad and classic VW Microbus is no longer available. 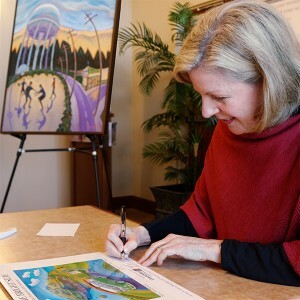 The exciting news is there’s a second chance to enjoy this image at home; it’s the cover image for Coast Central Credit Union’s 2016 Calendar where Beverly’s artwork is not only the cover, but each month brings a new display of a familiar scene. Left on Trinity may be out of print as a limited edition, however, Beverly has several other prints featuring whimsical views of familiar North Coast sights including her newly released images, Crossing the Mad and Midway. Crossing the Mad features Beverly’s daughter fly-fishing the Mad River while Midway is a tribute to her memory of the Midway Drive-In as it was in the 1950’s. Beverly’s original paintings and limited edition prints can be found at the Trinidad Art Gallery in Trinidad and at Coast Central’s 2650 Harrison Ave location though October 2016. Harper’s whimsical prints are also featured here at Meridian Fine Art and for the complete online array including formal impressionistic paintings please visit Beverly Harper Artwork. 7 Responses to "Beverly Harper – New Prints, 2016 calendar"
Thank you for your nice message. I can leave you a signed calendar at Mid-City Motor World in the Toyota Showroom tomorrow. My daughter has a desk there, just ask for Courtney. OMG! It’s my lucky day! Thank you so very much. I will collect it as soon as I can. We love your calendar Bruce picked up at the Willow Creek branch of Coast Central and I have been trying to find them for sale…? I’d love to have 3 for my “grown up in Arcata” children. Are they available locally or by mail? While supplies last, the CCCU calendar of Beverly’s whimsical artwork is available without charge from all CCCU branch offices as well as at Mid City Motor World’s Toyota showroom. Hello Carole. Thank you for your interest in Beverly’s artwork. The Calendars were all distributed shortly after they were released and there are no known copies available.